Are you ready for Family Heritage Night? If you haven’t turned in your form, you are in luck – the deadline is extended to Friday! Share your heritage with a flag, a display, food and even traditional clothing, if you like. Forms are in the office today and available in the link below. The big night is coming up next Tuesday, so now is your chance to join in the fun and travel the world in our own gym. 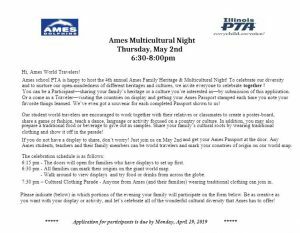 Ames school PTA is happy to host the 3rd annual Family Heritage Night! To celebrate our cultural diversity and to nurture our open-mindedness of different heritages, we invite everyone to celebrate Family Heritage Night together ! You can be a Participant—sharing your family’s heritage by submission of this application. Or a come as a Traveler—visiting the countries on display and getting your program stamped each time. 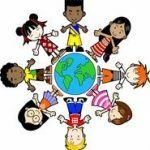 Our student world travelers are encouraged to work together with their parents, relatives or caregivers to create a posterboard presentation and a national flag about their family’s heritage. In addition to a poster, families may also prepare a traditional food or beverage to give out as samples. Share your family’s cultural roots by wearing traditional clothing and show it off on stage in the gymnasium! 6:15 pm – The doors will open for families who have displays to set up first. 6:30 pm – All families can walk around to view the displays and try food or drinks from across the globe. you want with your display, and let’s celebrate all of the wonderful cultural diversity that Ames has to offer! Application for participants is due by Wednesday, Jan 31ST, 2018. Welcome to Family Heritage Night! 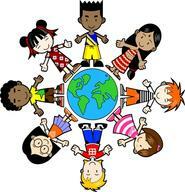 Let’s celebrate our cultural diversity together by traveling the world around you. Visit Ames gym & the multi-purpose room at 6:30-8:00 pm, Tuesday February 7th, 2017. Don’t forget to bring the Ames passport and try to win the gift card! For volunteer opportunities, kindly contact Helen or Joan at gustn@hotmail.com or kohnketown@comcast.net. We have a special event coming up: Ames 2nd Annual Family Heritage Night on Tuesday, February 7th! It’s a chance for our students and families to celebrate and share their cultural diversity. Please sign up to volunteer for set-up and running things smoothly – we need your help to make this night great. Note: SignUp.com does not share your email address with anyone. If you prefer not to use your email address, please contact me at gustn@hotmail.com and I can sign you up manually. Also, it’s not too late to register for Family Heritage Night! Bring a display board, dress in traditional garb, share a tradition on the mic. Let’s come together! If you haven’t already done so submit the application today, just email us at gustn@hotmail.com. We hope you have made plans to join us Tuesday, February 7 for Ames School’s 2nd Family Heritage Night! 6:30 pm – All Ames families are invited to view the displays and sample food/drinks from around the globe. 7:50 pm – Clothing Contest and Lottery winners announced! If you would like to volunteer, sign up using our volunteer website. If you plan to attend, don’t leave home without your Passport to Family Heritage Night! Some celebrate Christmas while others celebrate Hanukah; some eat macaroni and cheese for dinner while others eat rice and soup; some speak English at home while others speak Spanish. Each of us has a different cultural background, yet all are Ames families. During this winter break, we hope that you spend some quality time with your family and friends, talking about your cultural background and family origin. Let yourself be enchanted by the treasured stories of your family’s history and culture. Our 2nd Annual Family Heritage Night will be coming up on Tuesday February 7th. This night is a great opportunity for sharing your family’s countries of origin and sharing tales of adventure and travel. Based on the stories and research during this winter vacation, we hope you can collect enough information to make a flag or posters, and perhaps bring samples of a food or beverage from your heritage to share on Family Heritage Night. We hope to see you all on February 7th. For more information please see the links below.